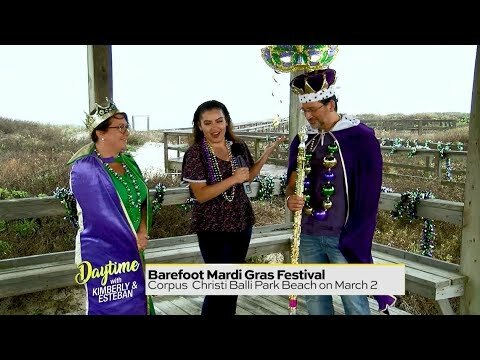 DWKE: Barefoot Marti Gras Festival in Corpus Christi | TV Host Danielle Banda | Corpus Christi Rocks! Danielle drops by Padre Balli Park in Corpus Christi where the 2019 Barefoot Marti Gras Festival will be taking place!!! She’s even got deets on how YOU can WIN tickets (visit her channel for that video)! Danielle Banda is an American Media Professional born in Laredo, Texas who has experience in Multimedia Journalism, Videographing, Photographing, Assistant Directing, Acting, Digital Editing, Casting, Producing, and Costuming. She is known for her work in Commercial and Non-Profit Television (2012), Print Media (2015), Radio Broadcasting (2012), Online Blogging (2015), Musical Performing Arts (2012) and Film (2012). Her literary background includes several published works (2005) and she is signed with L.A. Talent agency (2012), traveling between Texas and California for auditions and training. Banda graduated with honors from University of Texas Rio Grande Valley, earning a Bachelor of Arts Degree in Communication with an emphasis in Broadcast Journalism (2016) and is in the process of obtaining her Master of Arts Graduate Degree in Communication. She worked as crew on feature films such as “A Night in Old Mexico” (2013) starring award-winning actors Robert Duvall and Jeremy Irvin, as well as “Endgame” (2015) starring award-winning actors Valente Rodriguez, Efren Ramirez and Rico Rodriguez. Banda worked as cast/crew on several nationally and internationally recognized independent films and docu-series such as “Fearless Fight” (2015), Redemption: Between the Lines” (2016), “Piper” (2017) and “Latino Americans” (2014). She also worked crew on the Comedy Central Documentary, “Jeff Ross: Live by the Border Fence (Quarterly Special #3)” starring comedian Jeffrey Ross (2017). Banda served as TV Host (2017) and correspondent at KGBT-TV CBS Channel 4 for the lifestyle show, “Daytime at Nine” which aired weekdays from 9:00-10:00am in San Antonio (KABB-TV FOX 29), Corpus Christi (KQUI-TV FOX 38), the Rio Grande Valley (KGBT-TV CBS 4) and other areas of South Texas. Her celebrity interviews include but are not limited to: Fashion Icon Betsey Johnson, Actor/Professional Body Builder Lou Ferrigno, “Winnie the Pooh” Voice Actor Jim Cummings, “Twilight” Actor Jackson Rathbone, Oscar Award-Winning “Coco” Film Voice Actor Carlos Moreno Jr, NBC’s “American Ninja Warrior” Reality TV Contestant Abel Gonzalez, New York City “Les Miserables” Broadway Performer Mary Kate Moore, NBA Spurs Player Champion Danny Green, Three-Time Olympic Gold Medalist Misty May, etc. Today, she serves as TV Lifestyle Host, Correspondent & Producer (2018) for the entertainment show, “Daytime with Kimberly and Esteban” (DWKE) which airs on KABB-TV FOX 29, KFDM-TV CBS 6, KFOX-TV FOX 14, KSCC-TV FOX 38, KGBT-TV CBS 4, KTXS-TV ABC 12 and other areas of the entire state of Texas. Lucifer Samael Morningstar is a fictional character appearing primarily as a supporting character in the comic book series The Sandman and as the title character of a spin-off.Though various depictions of Lucifer—the Biblical fallen angel and Devil of Christianity—have been presented by DC Comics in their run, this interpretation by Neil Gaiman debuted in The Sandman in 1989. Hilary Swank, Actress: Boys Don't Cry. Hilary was born in Lincoln, Nebraska, to Judith Kay (Clough), a secretary, and Stephen Michael Swank, who served in the National Guard and was also a traveling salesman. Her maternal grandmother, Frances Martha Dominguez, was of Mexican descent, and her other roots include German, English, and Scottish. Congrats to past Sydney Students Jda Kut & Dizza (Invincible Armour) who WON the UK DMC Team DJ Championships in 2011 and DJ Subway who won the 2016 IDA Australasian Scratch Championships!!! !Shouts out to Herbie J who played Future Music Festival (Sydney), Artama at Summerdayz (Melbourne), and Lindaluxe at Kiss My Grass (Melbourne).